The company behind the best Bluetooth speaker we love, the UE Boom, has completely revamped its smallest speaker into a new $100 noise machine. Ultimate Ears’ Roll could be the best new tiny guy on the market. The new UE Roll is the first smaller speaker designed by Ultimate Ears. Its predecessor, the UE Mini, was actually an old Logitech design that the the UE brand inherited when it was acquired by the consumer electronics giant. And we’re very excited that the company has designed the Roll more in the image of its snazzy older siblings, the Boom and Megaboom. Not that the Roll looks anything like its tubular cohorts. The Roll is more of a puck shape that’s intended to lie flat. It’s also got an attached bungee loop that you can use to hang the Roll from a door knob, a fence, etc. The dish-like design is 5.31 inches in diameter and weighs just 12 ounces. It’s not as small as our current favorite small speaker, the Sol Republic Punk, but it does comfortably slide into the back pocket of my Levi’s. The Roll is IPX 7 waterproof, which means that you can drop it in 5 meters of water for 30 minutes. And it’s splashproof probably indefinitely. 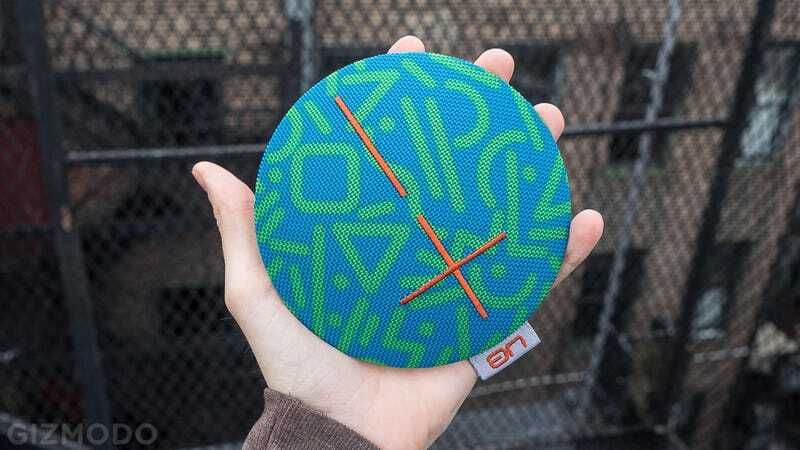 To that end, people who buy their speakers from UE online will actually get a little floatie so that your UE Roll can chill with you in the pool. The Bluetooth has a 65-foot range, and just as you’d expect there’s an auxiliary 1/8 inch input so you can plug in non-Bluetooth devices as well. It’s also compatible with the Ultimate Ears app so you can combine playback with multiple UE speakers. So if you had a Boom before, you’ve now got a two-speaker set. The UE Roll is available for order today for $100. We’ve only plugged it in for a few minutes, but between the slick design, and our great experience with the Boom, we’ve got a good feeling it might end up being one of the best options out there.